Canada Holidays vacations hotel listings and places to stay Hotels in Canada. 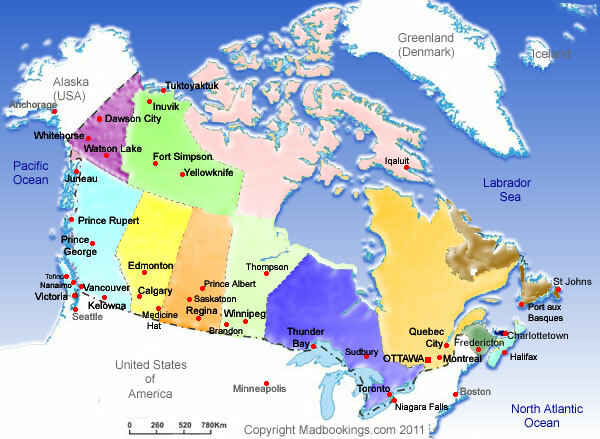 Canada holiday, hotel and travel guide, offering accurate information on Canadas hotels, lodges, camping sites and places to stay. All you need to know about Canada for a holiday or a business trip, weather, currency, moblie phone networks, internet, electricity, as well as booking of accommodation, hotels, camp sites and more around all of Canada. The Quality Inn Hotel & Conference Center is strategically located on the 400 just south of Parry Sound in Ontario Canada. This newly renovated Quality Inn offers contemporary comfort, excellent professional services and fine cuisine. Come see why we are Parry Sound's favourite hotel. A Great Inn and a lovely place to stay in Charlottetown, PEI ! The elegance and character of a stately old family dwelling, combined with today's modern amenities furnished in a warm home style atmosphere. Want to know the best months for skiing in British Columbia, golfing in Saskatchewan or harvesting maple syrup in Québec? When it comes to what the seasonal weather will be like when you visit, we’ve got you covered. You’ll also find information on current passport and visa requirements, Canadian public holidays, banking hours, currency matters, travel insurance tips, where to book hotels, accommodation and more. Start planning your visit to Canada today. Here you’ll find all the practical resources, tools, information and tips you’ll need. Towering mountain ranges, forests full of wildlife and kilometres of wild coastline combined with cosmopolitan city of Vancouver and some vibrant smaller cities always make British Columbia a memorable place to visit. Home of the Calgary Stampede Canadas landlocked oil province alongside the wild west, while snowboarders enjoy the fresh snow in Jasper Park the hikers revel in the splendour of the worlds third oldest National park at Banff. Saskatchewan is flat with rippling fields of grain and only two cities. Visit the Grasslands National Park, experience history in Moose Jaw or stroll alongside the river in Saskatoon, if nothing else the territory has a groovy name! Big city Canada Ontario has the countries biggest hip cities win Toronto and Ottawa offering art, culture and endless eating opportunities yet on the north of the territory lies Hudson bay with dramatic coastlines and to the south the mighty Niagara falls. 'The Gentle Island' of Prince Edward is home of Anne of Green Gables and the rolling landscape is complete with gabled farmhouses. Try some famous oysters and fall inlove with the relaxed and charming atmosphere. A rich vibrant and spirited culture that has matured over the years as it develops its modern day atmosphere from its European colonial past. Breathtaking scenery and the bustling cities of Quebec and Montreal among pockets of rustic and history. Unspoiled wilderness, coastal inlets, fly fishing rivers, quaint villages and snowy mountains cover this often overlooked area of Canada. Take in the farmers market in Fredericton and experince the amazing tides along the beautiful southern coast. Lupin Studded fields, quaint houses, picture perfect lighthouses and sandy shores combine with icy seas, coal mining areas, moose and of course hockey. Nova Scotia will welcome you with a comfortable embrace of beauty and friendliness. In a world of its own Canadas most eastern province enjoys passing Blue Icebergs, whales patrol the coastline and Puffins dot the coastline. Apart from the main city of St Johns you will find only small fishing villages. A vast and sparsely populated wilderness Yukon has a beauty and grandeur that will remain in your heart forever. Kluane National Park boasts Canadas five tallest mountains and the worlds largest icefields below the Arctic. Remote and real. Arctic tundra five times the size of the United Kingdom and a great swathe of Boreal forest make the mostly empty Northwest Territories (NWT) a stunning if remote wilderness area with landscapes that take your breath away. An assortment of uninhabited islands and frigid icy ocean challange the visitor to Nunavut, but Polar bears, Beluga whales and a few aboriginals are the rewards to those who brave Canadas newest territory.